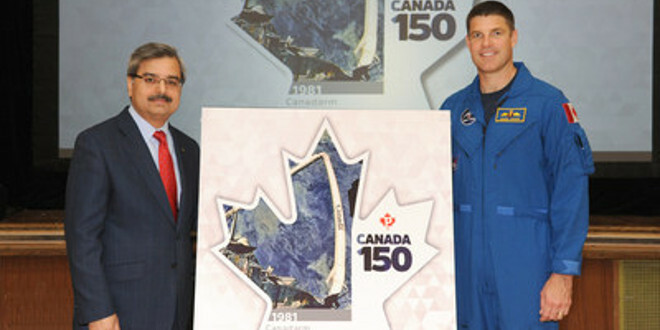 Deepak Chopra, President and CEO of Canada Post and Canadian Space Agency astronaut Jeremy Hansen. Credit: Canada Post. Canada Post has released the third stamp in a set of 10 that is being issued to mark Canada’s 150th birthday. The stamp features the iconic Canadarm and was unveiled by Canadian Space Agency astronaut Jeremy Hansen at at Glen Ames Senior Public School on April 28. Hansen was on-site at Glen Ames Senior Public School on April 28 to unveil the stamp and meet with Grade 7 and 8 students from the school’s robotics club as they prepare to travel to California to compete in an international robotics competition. Students competing were tasked to design, build and program a robot made entirely of Lego to solve a real-world problem. The team came up with the PetPortion – a robot that manages a pet’s weight by automatically giving it the proper amount of food based on its weight and level of daily exercise. Hansen also addressed the entire school and encouraged the next generation of Canadian innovators to pursue education in the fields of science, technology, engineering and mathematics. The Canadarm’s first mission was aboard the Space Shuttle Columbia on November 13, 1981. It manoeuvred astronauts, satellites and cargo over 30 years before it retired when the Space Shuttle program ended in 2011. The Canadarm launched Canada’s close partnership with NASA on human space flight. Eight Canadian astronauts have flown in space, participating in 16 missions aboard either a space shuttle or on the International Space Station: Roberta Bondar, Marc Garneau, Chris Hadfield, Steve MacLean, Julie Payette, Robert Thirsk, Bjarni Tryggvason and Dave Williams. Currently Canada has two active astronauts: David Saint-Jacques and Jeremy Hansen, and two additional astronauts are expected to be announced this summer. The Canadarm was instrumental in establishing Canada’s reputation for robotics innovation and led to a new generation of Canadian robotics on the International Space Station (ISS). It will inspire future generations of Canadian scientists and engineers as they develop new technologies that make the world a better, easier and safer place. Each stamp in the set has been unveiled by a distinguished Canadian individual or group related to the moment being celebrated. The setting for each stamp launch also directly relates to the moment being commemorated. The stamp that celebrates Expo 67 was unveiled in Montréal by Habitat 67 architect Moshe Safdie on April 27 and the stamp about the Constitution and the Canadian Charter of Rights and Freedoms was unveiled on Parliament Hill on May 3. The next stamp in the Canada 150 set will be revealed in Toronto on Tuesday, May 9. The others will be unveiled individually at cities across the country, the last of them on June 1. Each of the 10 maple-leaf shaped die-cut PermanentTM domestic-rate stamps measures 40 mm x 40 mm and is printed in 6 colours plus tagging. The self-adhesive stamps are available in a booklet of 10 (4 million stamps). A gummed pane of 10 stamps, with circle perforations 4.5 cm in diameter, is also available (80,000 panes). Official First Day Covers, one for each stamp design and each cancelled in OTTAWA ON, are available in a pack of 10 (10,000 packs). The stamp issue was designed by Roy White and Liz Wurzinger of Subplot Design Inc. in Vancouver, B.C., and printed by the Lowe-Martin Group. 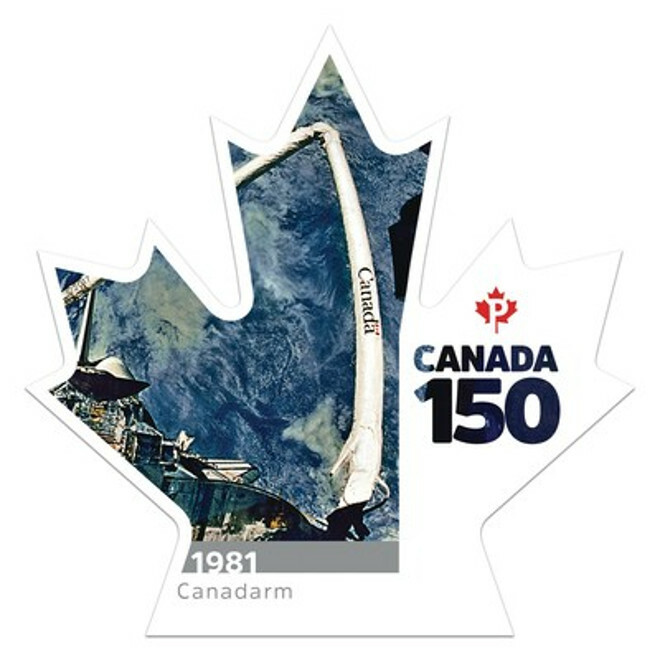 Canada 150 – Canadarm stamp. Credit: Canada Post.